Since Ocarina of Time 3D is now out in Europe, I’ve taken the liberty of publishing the remaining chapters of our Ocarina of Time 3D walkthrough so anyone who hasn’t experienced Ocarina of Time before can find all the help they need with any dungeon in the game. We’ll still be continuing the fan art feature based on chapter sets, however, so you’ll still get your daily Ocarina of Time fix. 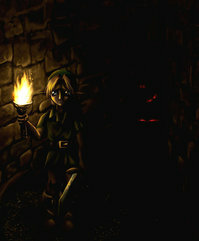 Today’s featured fan art depicts young Link traversing the Bottom of the Well. It was drawn by thelegendoflauri over at deviantART, and might be one of my favorite pieces of Ocarina of Time fan art so far due to its excellent depiction of the mood of the dungeon. You can check out more at lauri’s gallery page.